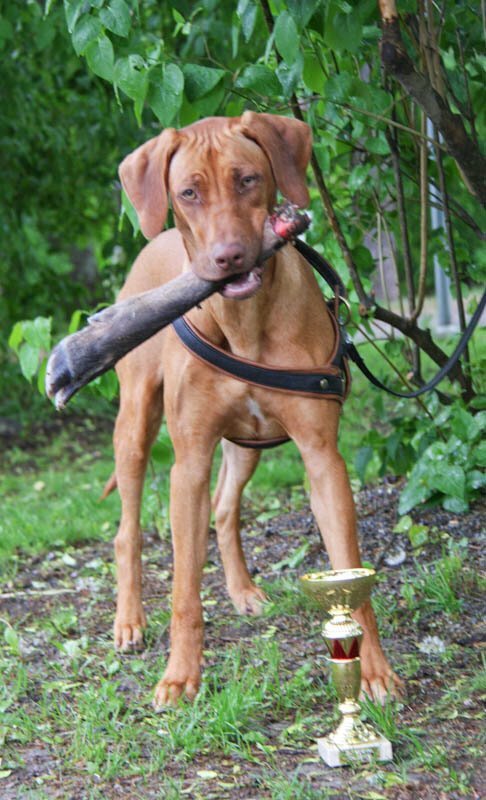 Klara had her very first blood tracking trial in Parkano 10.6.2012 at the age of 10,5 months. She's probably the youngest RR to take part in finnish "MEJÄ"-trial. Agelimit is 9 months. We did few puppytrainings last fall and this spring we have done few tracks with different lenght, model etc. About 200-400 meters. MEJÄ-trial is a tracking trial for hunting dogs. Finnish Open Class track is 900-1000meters long and its more than 12 hours old. It has two corners with blood on it and cloven hoof of deer in the end of the track. Klara did very nice job for such a young babydog. :-) She cleared up 1st and 2nd part of the track very well with nice suitable speed. Then on the third part, when she was already tired, she had hard work with the track which was probably messed up by deers or other animals. For a big luck Klara picked up the smell of cloven hoof from air and run at full speed the rest 40-50 meters towards the end of the track. So she got very good reward (lovely cloven hoof) from the hard work she made with the track! :-) I was so happy for her! Klara got 45 point of full 50 points. Here is the report written by the judge Aila Hauskamaa, but it's only in finnish. Koeselostus: Klara ohjataan kokemuksella jäljelle. Siitä alkaa hyvävauhtinen, verkkainen jälkityö. Ensimmäinen ja toinen osuus mallikkaasti. Ensimmäinen makaus ohi. Toinen makuu merkataan erinomaisesti. Viimeisellä osuudella tarkistuslenkkejä, joista kehoituksin palaa. Sorkalle tullaan ilmavainulla, vauhdilla. Sorkan nuoli ja otti suuhunsa. Nuori jälkikoira, jolle harjoitteet tuovat varmuutta.